When a mammal tooth erupts, it has a continuous covering of enamel. However, in many herbivores that eat abrasive foodstuffs, the enamel covering on the surface wears away, exposing the dentine underneath. (Since humans and other primates eat relatively soft foods, we mostly maintain the enamel covering of our teeth throughout our lifetime.) If the enamel on the surface of a tooth has invaginated during development (to form a pit), these pits are left as enamel “islands” once the rest of the enamel on the surface of the tooth has been worn away. These islands of enamel (surrounded by dentine) are known as fossae (singular: fossa) or fossettes in upper teeth and fossettids in lower teeth. 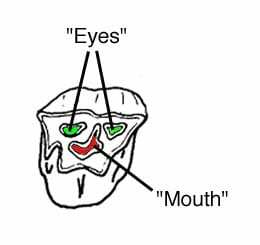 In the ancestral condition, slightly worn typothere teeth demonstrate a characteristic pattern of fossettes that resembles a face; the large, central fossa is the “mouth” and the two labial fossettes are the “eyes” (see the diagram of a Notopithecus tooth above). This pattern is usually not evident in unworn teeth, nor is it usually evident in teeth that have been heavily worn. However, it is believed that most of the other patterns of typothere occlusal morphology were derived from this ancestral condition. In later typotheres, the ancestral condition is modified to such a degree that it is no longer recognizable at all; very hypsodont (or hypselodont) taxa lose all enamel islands due to developmental constraints and have only infoldings of enamel from the exterior surfaces of their teeth.